What is the process for neutering? What age to neuter a cat? Will neutering make make my cat get fat? Why should I neuter my cat? 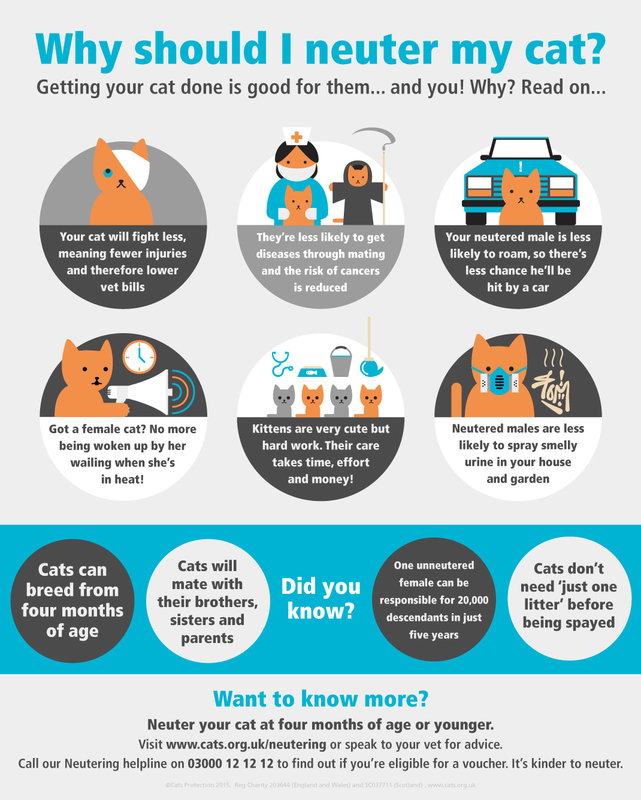 With thousands of unwanted cats in the UK, one of Cats Protection's key aims is to champion the neutering message. Cats are effective breeders, so making sure your cat is neutered is particularly important. Aside from preventing unwanted kittens, neutering has plenty of health benefits too. Neutering (also called spaying) is a surgical operation to prevent female cats from getting pregnant and male cats from making females pregnant. This simple operation will be performed by your vet, with your cat being under general anaesthetic. Cats are fairly resilient and in most cases you'll be able to drop off and pick up your cat from the vet the same day. They'll recover quickly from the operation, although your vet will be able to advise on the best care during this stage. Cats Protection recommends that kittens are neutered at four months old or younger, although cats can be neutered at any age. You’ll need to book an initial appointment for the operation. Vets may require the cat to be brought for a pre-anaesthetic check before the day of the operation. The cat will normally be admitted between 8am-10am in the morning and able to be picked up that evening and will need to have been kept indoors without food for some of the night before. Your vet will advise. Modern anaesthetics and pain relief mean that the process is really painless these days. Many vets also operate using a tiny incision on the left side of the cat, reducing pain in comparison to the equivalent procedure in dogs or humans. Vets will also give the cat pain relief injections covering the period after surgery. If you are unsure, please speak with your vet. Vets usually advise that the cat is kept indoors for a few days after surgery and may need to wear a lampshade shape collar to stop it from chewing its stitches. Stitches might need removing after seven to ten days, or may be dissolvable. In the longer term, cats have a much lower energy requirement and as a result will need less food. Kitten neutering is proven to be safe and effective and avoids many of the potential complications that can be had later in life. Cats Protection recommend that your pet cat is neutered at four months of age or younger. It is important that the procedure is done before the cat begins puberty, preventing any unplanned pregnancies. There is no evidence to show that it inhibits growth or causes urinary problems, with experiences showing kittens resume their normal activities and routines after surgery much more quickly than adult cats. If you're looking for a kitten neutering vet in your area, take a look at our register. Neutered cats need less food after surgery, so you will need to reduce their daily food intake after they are neutered. Neutering in itself doesn’t make cats fat. Neutering is the best way to deal with the issue of unwanted pregnancies - by preventing the problem in the first place. In addition, it also has health benefits for your cat. The chance of contracting some infectious cat diseases will be reduced, as will the likelihood of developing mammary tumours (breast cancers), pyometra (life threatening womb infections), testicular cancer, and many other illnesses. Unneutered male cats are more likely to end up injured from fighting, or stray from home. They can often spray smelly urine to attract potential mates, and experience stress from frustration if they don't find one. Neutered males are less likely to roam or fight and their urine will smell less pungent! Female cats that haven't been neutered can become pregnant from four months of age, are more likely to contract diseases and are even at risk of developing infections. Neutering your female cat means there won't be any unwanted kittens, so there will be no expense associated with litters. Did you know that at Cats Protection, we help thousands of people with financial assistance for neutering each year? You can help us continue to do so by supporting us, like choosing to donate or opting in for payroll giving.